The presenter questioned the number of decisions that were going against the Bluebirds. Radio host Adrian Durham has launched an impassioned defence of Cardiff City and Neil Warnock, labelling their defeat at Burnley on Saturday an "absolute disgrace". 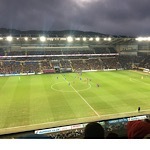 The Bluebirds have been on the wrong end of some controversial decisions over the past few weeks, with the home defeat to Chelsea and the latest loss at Turf Moor chief among them. Manager Neil Warnock confirmed that he would contest the FA charges brought against him in the aftermath of the Chelsea game, but Durham defended the boss, saying he was "braver" than his contemporaries and praised his honesty. "I thought it was an absolute disgrace at Turf Moor on Saturday for so many reasons," Durham began. "You have got a Cardiff team who have suffered all sorts of stuff going against them this season, from stuff that might be self-inflicted i.e. not making the right signings in the transfer window to some of the way more serious stuff, the tragedy in January that we all know about. "So Cardiff have suffered. I know that's not a reason to give them decisions, but to have so many controversial decisions go against them game after game after game, makes me wonder what the hell is going on? "Now, Neil Warnock, we all know this, he's been a manager for 30-odd years and we know how Neil Warnock operates. "He's been doing it all his career. He isn't the only manager who has a go at referees, some are quite cute with it with their wording afterwards, but we all know exactly what they mean. "He's more forthright, he's braver. He actually says what he thinks and he gets fined for it and he gets done for it. "But he's at least telling us exactly what's on his mind. He's being honest about it. And because of that I feel, this is not something I often come up with, but it feels to me like it's working against him and it's working against Cardiff." He added: "When you see Cardiff suffer some of the outrageous decisions they've suffered this season, and it's relentless game after game after game as we head towards the end of the season and what looks like it could be a relegation for them, is anyone else putting two and two together and thinking 'hang on a minute'? "For 30-odd years he's been having a go at officials and now Cardiff are on the wrong end of some outrageously bad or at least some controversial decisions." Cardiff face Brighton in a make-or-break game at the Amex on Tuesday night. Blimey. There's not many times I'd applaud Durham's comments on most things and I'm not a fan of blaming poor officials as an excuse. But given NWs historical honesty and vocalism when poor decisions have been made, I think that AD is spot on. Refs have a game plan ahead of the match and I honestly think that there's a negative bias against us. We were not much liked by them before NW took over and now we are even less; it's that apparent that even neutrals are now noticing. I'll be at Brighton tomorrow as I was at Burnley and I would not be surprised to see similar decisions go against us from officials who seem to be untouchable and with an agenda. GrangeEndStar wrote: Blimey. There's not many times I'd applaud Durham's comments on most things and I'm not a fan of blaming poor officials as an excuse. But given NWs historical honesty and vocalism when poor decisions have been made, I think that AD is spot on. No point crying about the past. Have to get past it and try and pick up enough points.